The small A5 managed to make itself a big name in both professional environments as well as in computer or desktop applications. 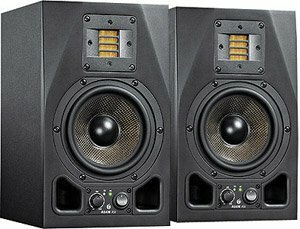 A wealth of truly outstanding reviews and many awards helped to establish this speaker as one 'of the best small monitors' and a 'great choice for the small studio.' The similar dimensions and name could make one believe that the A5X is nothing more than a new version of the A5. A quick listening however leaves no doubt that the A5X is much more than that. Like all other models of the AX-Series it features the proprietary X-ART tweeter. The very data of this technology shows that it is at the forefront of what tweeters can accomplish. Numerous listening tests have confirmed this.